Electronic scanners confirm the hypothesis: language is based on a hereditary capability, is genetically coded. Debusschere: “First evidence for sophisticated speech before birth. … It is one of the big questions in linguistics: are we born with a refined feeling for language or do we build our talent from birth? “According to Fabrice Wallois, leading a team neuroscientists at the University of Picardy, unborn babies as early as the sixth month distinguish syllables. Electronic scanners show that the linguistic connections in the cortex are present and functioning before birth. These structures do not need to built up by repeated exposure to voices as is commonly stated. The changes in oxygen supply that is observed to certain parts of the cerebral cortex, give an answer to the question if whether linguistic feeling or either education make the recognition of syllables possible. Wallois concludes from the observations that at least part of the speech recognition capabilities are innate. 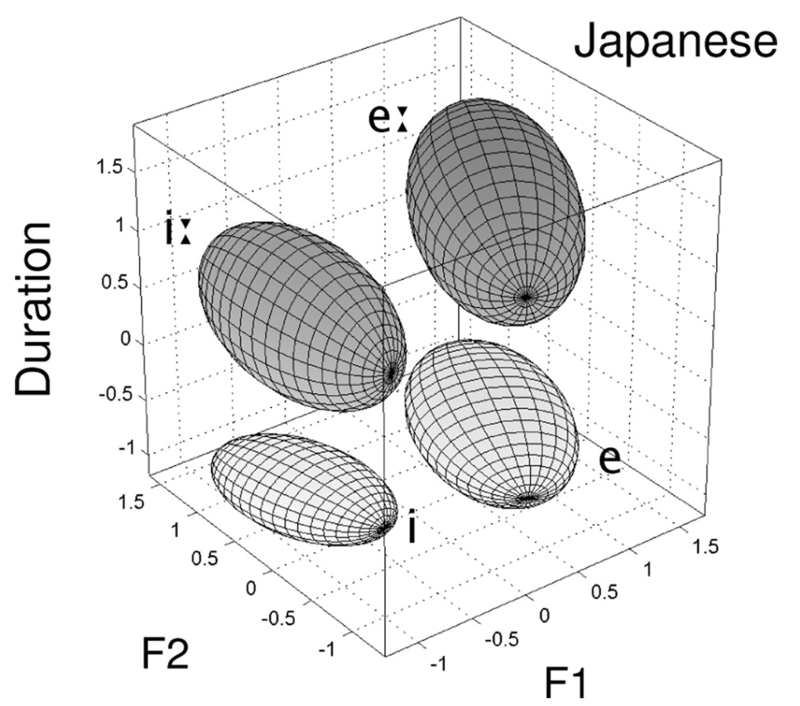 Researchers from the University of British Columbia claim that they have discovered “language-specific vowel categories” both in English and Japanese. The statistics allowed them to draw up an algorithm, the OME, that visualises the “Expertation-Maximization”. “Infants are initially responsive to a wide variety of native and nonnative speech sound contrasts.” English children can e.g. at a very early age distinguish Hindi sounds or use Zulu clicks. Adults lose these abilities. 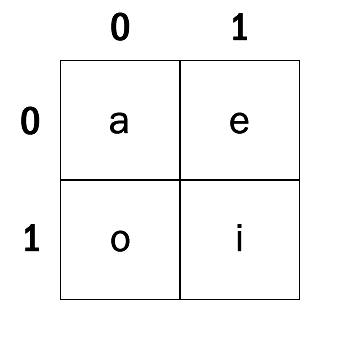 The OME model consists of four vowels placed against three coordinates. It can be easily converted into a semantic space. 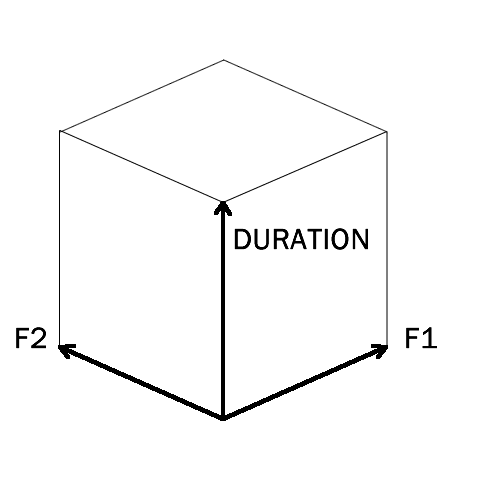 The question is to what depth, height and breadth dimension the parameters F1, F2 and DURATION correspond. OME leaves no doubt about the direction of semantic opposites. 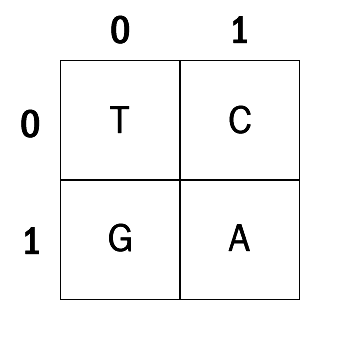 (fig.4) The authors indicate these with three antonyms. The research of J. F. Werker into “vowel pairs” in English and Japanese results in the following classifications: (phonetic script, “i” as in tick, “i:” as in meat, “e” as in when, “e:” as in mail). The method which we use in classifying colours can also be applied for the classification of vowels. 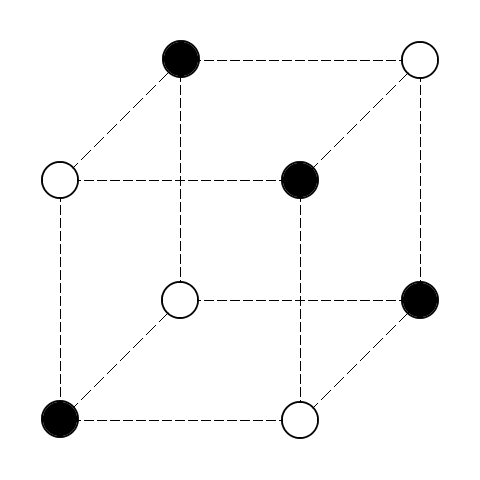 (fig.5) On the vertices of the large cube come 8 vowels. 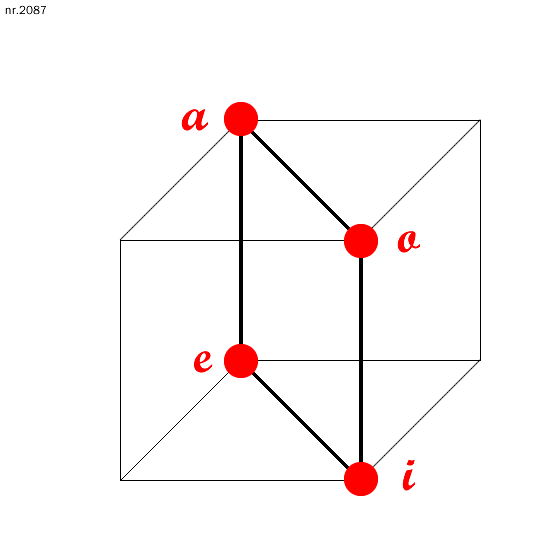 Around each of these corner points are 8 variants on a vowel. 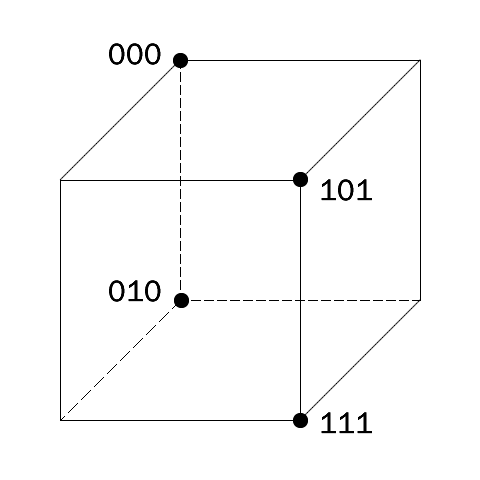 When we look from the rear of the big cube (fig.6), the 4 vowels are located in one plane, in the order -> a -> e -> i -> o -> as in the diagram of Eyckman . Or in the Chinese notation (5) the four symmetrical trigrams, combinations of broken (- -) and whole (—) lines. 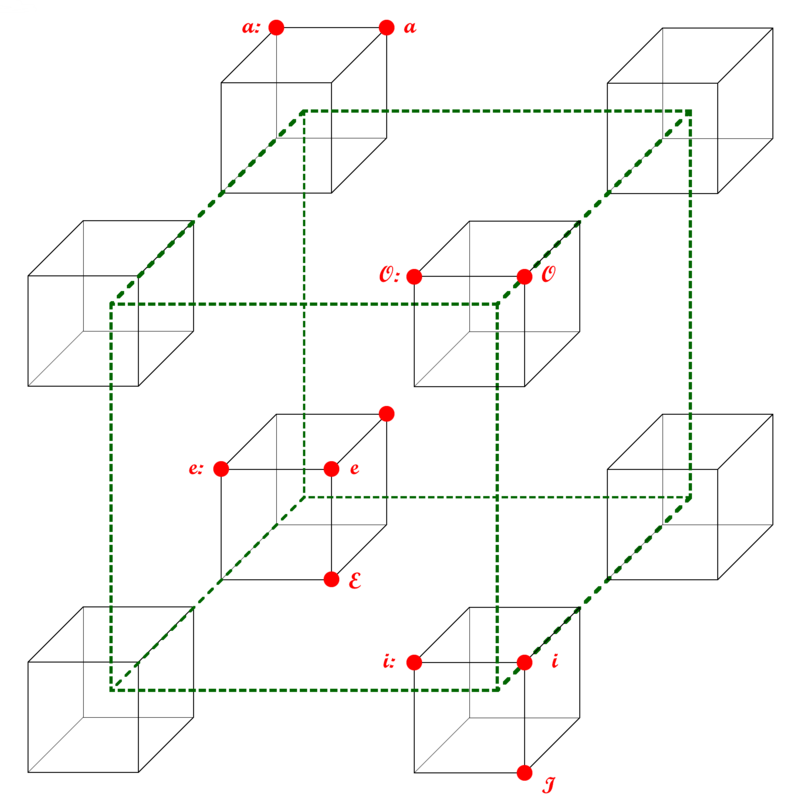 Of the eight vertices of the cube, one is in all respects ‘yin’ (- -): the corner point behind, above, right. 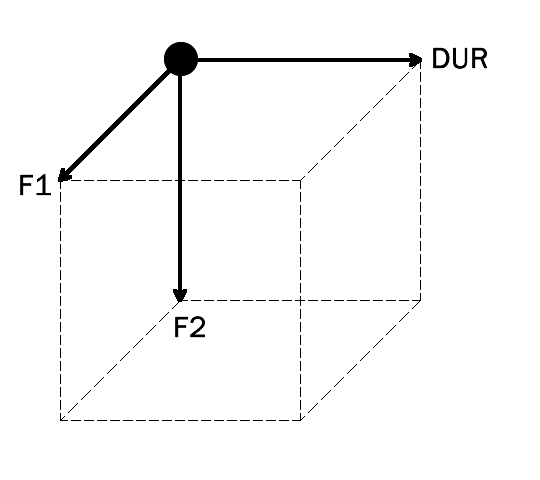 From an external perspective, the D.H.B.-order on this corner is clockwise. Figure 7. 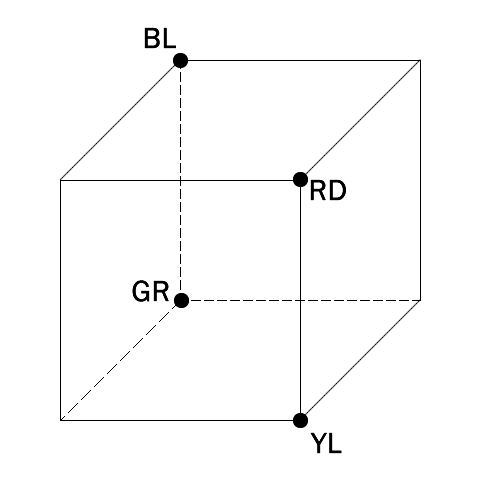 The D.H.B.-order is clockwise for 4 vertices of the cube. Figure 8. The antonyms prove that F1.F2.DUR. = D.H.B. F1.F2.DUR. must rotate counterclockwise to achieve a D.H.B. order. 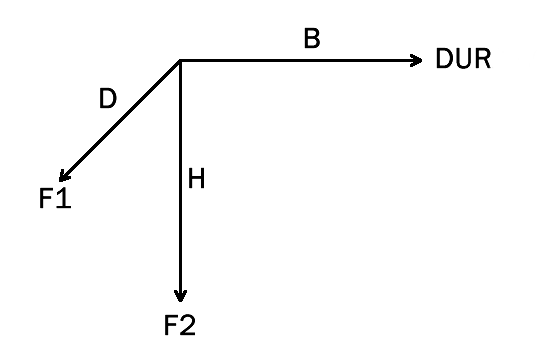 However, according to figure 9, at this corner point the rotation should be clockwise for to achieve a D.H.B. order. 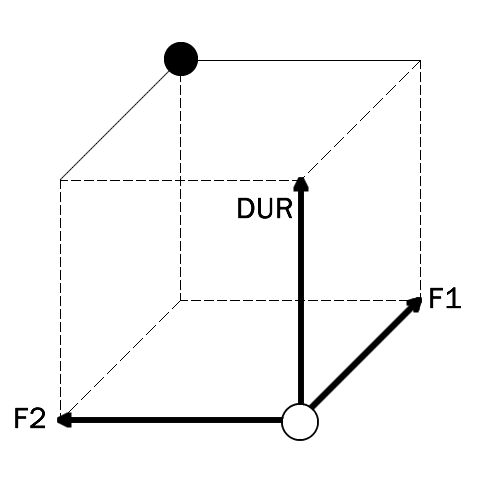 This contradiction, which concerns only the display, can be corrected by changing one of the three vectors or all three vectors in the OMLE model, so that F1.F2.DUR. = D.H.B. is preserved. 2. 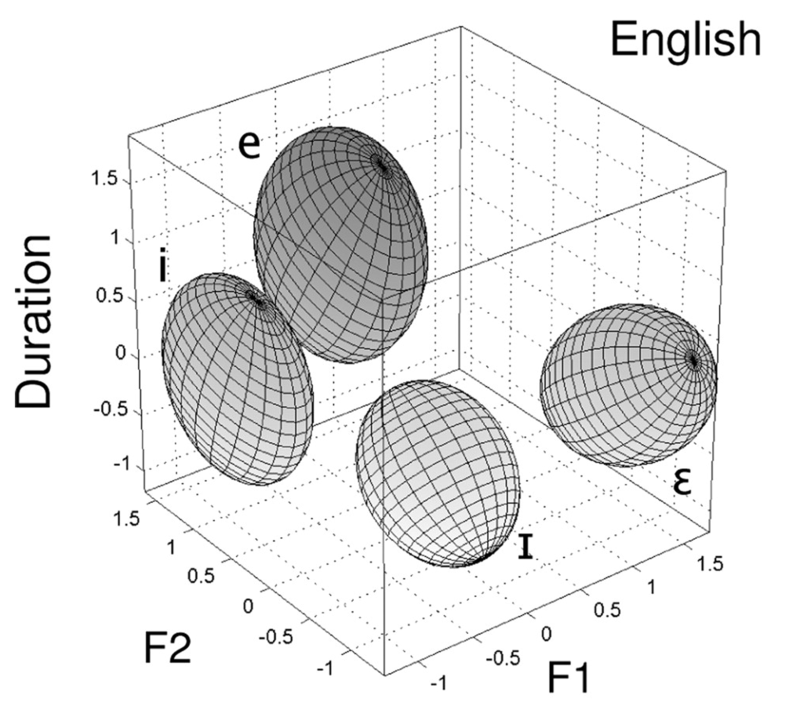 G. K. Vallabha, J. L. McClelland, F. Pons, J. F. Werker, and S. Amano, (2007) Unsupervised learning of vowel categories from infant-directed speech, Proc. Nat. Acad. Sci., vol. 104, no. 33, pp. 13 273–13 278. 3. Alpaerts F. (1981) De Denk-beeldige Ruimte, Antwerpen Genetic Coding. 4. De Groot A.W. (1968) Inleiding tot de Algemene Taalwetenschap, Groningen Wolters-Noordhoff N.V.
5. Wilhelm R. & Baines C.F. (1977) The I Ching, Book of Changes, Princeton University Press.